If you believe that luxury can be affordable then, Lily Beach Resort & Spa will reconfirm your belief as you enjoy a warm vacation next to the turquoise waters of Maldives. 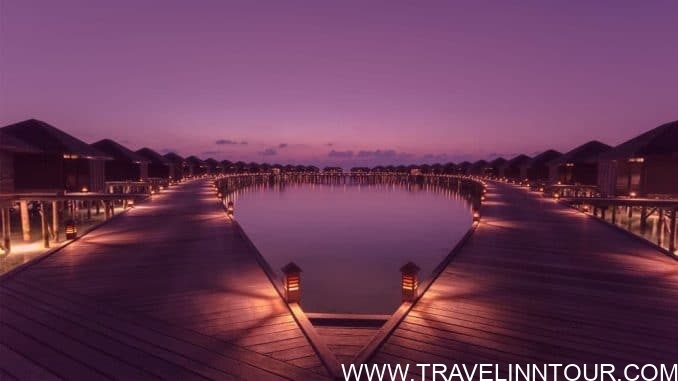 The Lily Beach Resort & Spa is located on Huavahendhoo, south of the Ari Atoll, by airplane just 25 minutes from Male. The distinctive features of Lily Beach Resort & Spa are reef-like accommodation, surrounded by lush greenery, with a variety of beautiful sandy beach and shallow lagoon houses with spectacular views. various underwater life around the ocean. An absolute quality ratio that allows you to have a quiet and relaxing vacation with your friends and family. Though the cottages of the five star Lily Beach Resort & Spa seem to be coming straight out of the exotic coastal locations, they are well equipped with all modern facilities which can be required by international tourists. Renovated and reopened in 2009, 119 villas are air-conditioned and have a TV with DVD or CD player, minibar, telephone, and free Wi-Fi. The villas can be selected from luxury villas with jacuzzi, along with beach villas, family front beach villas, lagoon villas and each with its own attractions. The culinary services of the Lily Beach Resort & Spa are also equally fascinating as you get to choose from an offering of traditional Maldivian cuisine or other international cuisines like Indian, Chinese, fusion and so on. For those of you who look forward to pampering your body during vacation times, there are the water spa pavilions which offer lucrative packages. Apart from enjoying the range of spirits and foods, you can also enjoy the pleasure of going through the local handicrafts stores which also offer a chance to witness the making processes. For sports and adventure lovers, the Lily Beach Resort & Spa offers a variety of options like dive centers and water sports, tennis, volleyball, scuba diving and so on. Children also get their recreational facilities in the Lily Beach Resort & Spa with options like kids’ club which receive proper supervision, children’s swimming pools, excursion trips, cyber games and so on. It is because of all these reasons that the Lily Beach Resort & Spa is rated as the 23rd best all-inclusive hotel in the world. In Asia, it has its ranking as the 3rd luxury place where every facility is made available under one roof. Therefore, if you are looking forward to a destination which can bring you peace, as well as the beautiful natural surroundings then, Lily Beach Resort & Spa is one of the best options to go for.